The new Revlon Parfumerie Scented Nail Enamel rolled out in Australian stores in early February, and though I tried hard to resist, these two shades were calling my name. In fact, the entire display was calling my name, and I would have happily picked up the whole thing and taken it home, cute old fashioned sweet shop bunting and all. After many consecutive days of rain and decidedly gloomy weather, I had no choice but to use artificial light for these photographs. I much prefer to use natural light, so my apologies for the less than good quality images. All swatches are two coats and a top coat. I use a fast dry top coat every time I do my nails, simply because I don't have time to wait for them to dry, and often do my nails in the evenings. The scent of Wintermint is as one would expect...minty...quelle suprise?? It is a pleasant, sweet, soft minty fragrance. The fragrance is marketed to be noticeable when the enamel is dry, however I can smell it as I am applying the polish. The shade itself is very pretty. Along with the blue glitter you can see, it also has a very fine gold shimmer throughout, which the lighting above picks up nicely. I don't have anything like this shade in my collection. Think of it as a mint green with a twist. As I mentioned above, I always use a fast dry top coat. Personally, I find very little difference in the intensity of the scent with or without a topper. It certainly isn't the type of fragrance that throws itself around the room, but one that you are subtly aware of any time your lovely polished fingertips near your face. I have found the scent fades gradually over 2-3 days. Autumn Spice has a gorgeous depth of colour, with lovely gold, copper and rose gold shimmers throughout. I found that those lovely golden shimmers weren't as visible on the nail as they are in the bottle. I will try to add some more swatches in natural light once we get some more sunshine! 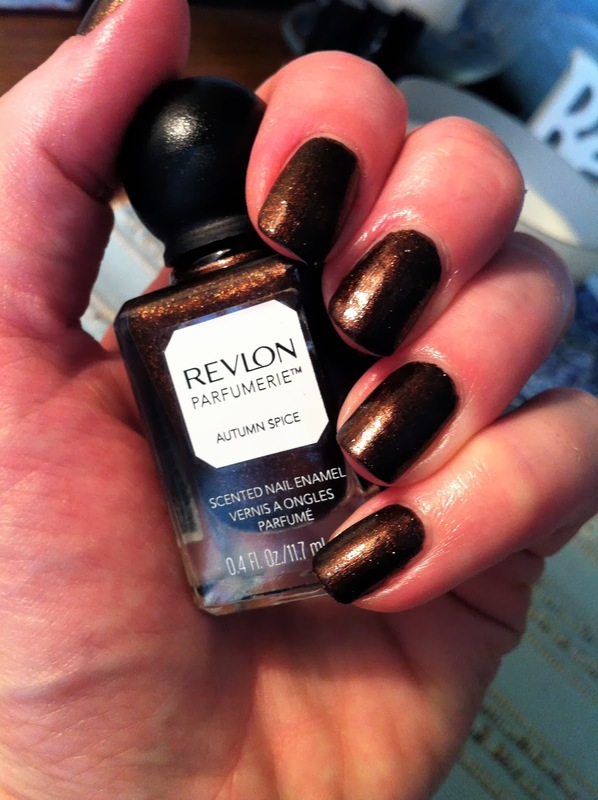 Autumn Spice is also a sweet fragrance. To my nose, a combination of a sweet honey cake and a milky chai tea. Although it is a very dark shade, it doesn't look black on the nail as some very deep shades can do. A perfect Autumn/Winter shade, and again unique to my collection. As I mentioned, many of the shades caught my eye ( will try to be good ) and what a beautiful little vintage bottle/bottles to have on display! I purchased mine from Priceline during a recent 2 for $20 sale. At $15.95 each they are on the pricey side. The bottles contain 11.7ml of product. Do you have a favourite shade/scent in this line? Do let me know your thoughts in the comments below! Last week us Aussies had some exciting news...elf ( eyes-lips-face ) cosmetics are now being sold in Kmart! Hooray! Whilst I have come across the odd little stand here and there, it is really nice to finally be able to look at, touch and feel products first hand, and to be able to take them home the same day! I haven't had a chance to check out my local store, so I am not sure exactly which products they are stocking, however I thought I would share some thoughts and swatches of three of the baked eyeshadow shades that I own. I purchased these from the Australian website, here for $8.00 AU each. One of the features of baked products is that you can use them wet or dry, depending on the depth of colour, or finish that you are after. Elf Baked Eyeshadow - "Burnt Plum"
This is a beautiful plummy-brown shimmer, perfect for adding depth to the outer corner/crease. Excellent pigmentation and colour pay off. Elf Baked Eyeshadow - "Pixie"
A very pretty warm peachy-pink with gold shimmer, and could double as a blush/highlight. Nicely pigmented, though not as smooth on application as Burnt Plum. Elf Baked Eyeshadow - "Toasted"
A stunning golden bronze that boarders on a metallic finish, the softest and smoothest of the shades I own, highly pigmented...gorgeous! It works perfectly as an "all over the lid" shade, blend up into the crease, and you're done. There are six shades in the baked eyeshadow range available on elf's Australian website. The other shades available are "Enchanted" "Bark" and "Dusk". I have a few other single eyeshadows and a couple of blushes from elf''s Studio line, do let me know if you would like to see some swatches. Do let me know your favourite elf products in the comments section, I would love to hear from you! As soon as a I saw a picture of this palette, I just knew in my 'makeup heart' that I would love to own one of my own. The lovely Zoe from Zoeblogsbeauty posted a picture of this palette on Instagram, and whilst we were chatting ( and drooling) she let me know about Tarazz, an online site that purchases and ships Tarte (and many other brands), to Australia on your behalf from Sephora. This is my first experience with Tarte products, after hearing so much about them on You Tube and reading many blogs. It was always one of those unattainable brands, being very difficult to source in Australia. Such difficulties typically result in one wanting something even more!! Am I right? The CC Matte 'be MATTEnificent' palette from Tarte is also my first all matte eyeshadow palette. I am by no means an eyeshadow officianado, however I have some photos, swatches and thoughts to share with you, and also a little bit about my shopping experience with Tarazz. In collaboration with Hollyannaeree, there are two "look" ideas included to follow. A double ended brush comes with the palette. The shorter flatter shader brush packs colour on nicely, while the small precise blending end is quite stiff, and picks up the perfect amount of colour to slowly build up and blend the crease and defining shades. Swatched in natural light no primer. I have been using 'dream in chocolate' as my go to liner...it is stunning. I push it into my upper lash line with a small, stiff angled brush. It beautifully lines your lashes for more subtle definition. I have put away my liquid liner. Both these shades are soft and creamy, and very nicely pigmented. I can safely say that I have used this palette every day since she arrived. Now this may be partially due to the fact that it is my first all matte palette, and that it is new. Having said that, I find it perfect for an every day natural eye look, which is primarily what I do on the daily. The packaging, apart from being sooooo pretty, is strong, sturdy and luxurious. It has a lovely full size mirror, and a nice quality double ended brush included which I have used and enjoy. All of the eyeshadows are definitely matte, however in my humble opinion I believe when you apply the blush to the cheeks a tiny little sheen appears. All shades are beautifully soft, and feel like silk to touch. If you are heavy handed with your brush you will kick up a lot of product. I just gently press my brush into the pan. With the exception of the two liner shades and 'view from the taupe', they are quite powdery, however the pigment glides over the skin so beautifully. Definitely not one to fluff your brush about in like you're mixing up a batch of pikelets. Just be gentle. I have tested the shadows both with and without a primer. 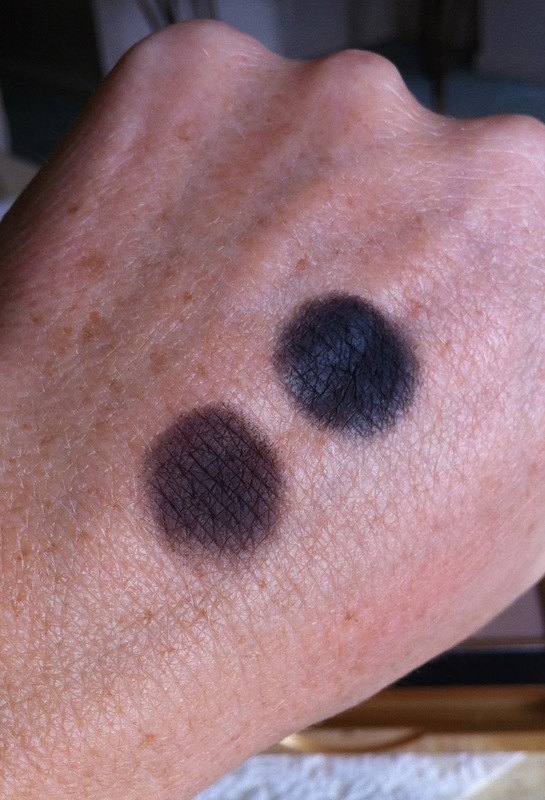 Without Primer : I found the colour payoff to be very good on my light/medium skin tone and the shadows lasted about 8 hours without fading or creasing on my oily eyelids. With Primer : I am currently using Bare Minerals Prime Time eyeshadow primer, and put these shadows to the test for a ten hour night shift delivering babies. And the end of my shift, close to 12 hours after application I had a tiny bit of creasing in the inner half of my lid...otherwise it still looked beautiful. The addition of primer improved the depth and colour payoff considerably, and would likely be a necessary step for you if you have a deeper skin tone. 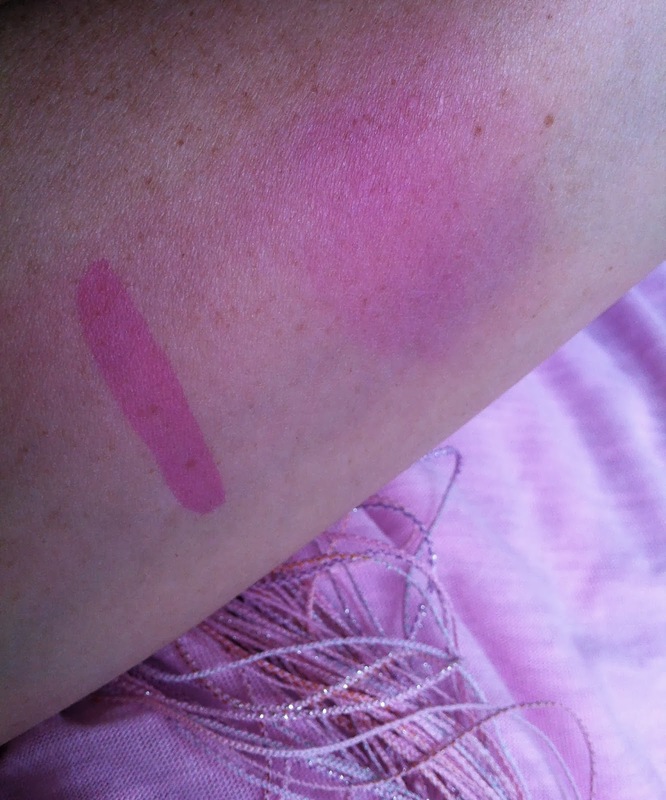 I have only used the blush in elevated a couple of times. Tarte blushes have such a lot of hype around them, I was just so excited about owning one! Elevated is a new shade in the range of amazonian clay blushes. In the swatch above I really had to work to build up the colour. It is a beautiful universal shade, though I was a little over excited building up the colour one day, and found it to look a little muddy on my cheeks. Now this is likely to be user error, but I need to do a little more playing with this one. If you have a medium to deeper skin tone I am not confident that it would be enough for you? My shopping experience with Tarazz was very positive. I have nothing negative to say. Tarazz markets itself as an online shopping mall, and that is a great way of describing it. You can shop for women and mens apparel, homewares, luggage, children's toys and of course beauty. You are purchasing from the actual stores, with Tarazz as your middle man. From pressing the 'confirm payment' button ( *heart rate rises*) to the palette arriving on my doorstep from the US was 9 days in total. Nice. I received three emails during that time informing me of each stage of my order. I knew where my order was, and its next destination. It was well wrapped in bubble wrap and packaged securely, and arrived in perfect condition. I paid $48.13 AU for the palette, and $15.00 for shipping. $63.13 in total, which I believe is great value for 8 good sized eyeshadows, and a great sized blush, all wrapped up in a beautiful palette. Thanks so much for stopping by! Please feel free to leave a question below in the comments section, or just tell me all of your favourite Tarte products!